The start is at Oban Sailing Club heading North along the shore road. Bear right up Glenmore Rd and up the steep Haggarts Brae to rejoin Glenmore Rd. Bear right at the top and then left onto Pulpit Drive. After 100m, take the path signposted `Footpath to Kerrera Ferry’. One mile later, Kerrera Sound comes into view. Do not take the path to the ferry but keep left and follow the cart track which continues to head SW. On meeting the lane, turn right through gate and head downhill. Towards the bottom, at a sharp LH bend, leave the lane and head for the marshal on top of Dun Uabairtich. Leaving the top, beware of dangerous gulley and head NW along the cliff top path past the ferry and continue to take the upper path along the cliff top. Pass to the left of all fences. Eventually further progress is blocked and the path turns down a prominent gulley at Kilbowie. Take care rejoining the road and return along the shore road to the Oban Sailing Club House where the dinghies will be drawn up between the Sailing Club Pier and the Borro Boats Pier (The latter must not be used). 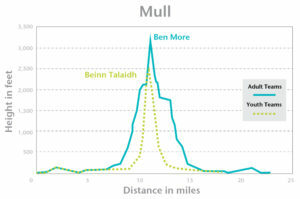 Please ensure that you cross the finishing line together.The first pair of runners home wins the Oban Slip Trophy. Before boarding dinghies, runners must don lifejackets. Yachts will be waiting in the bay and must be outside the area of moorings. 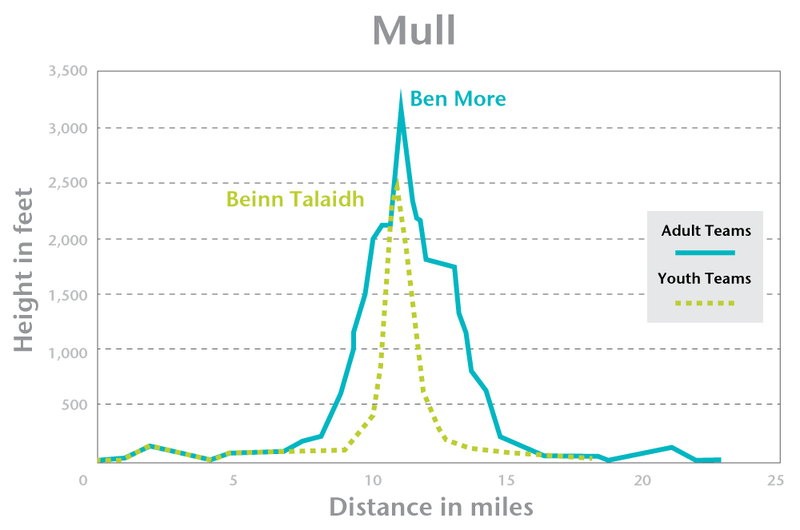 Yachts may be directed to round specific bouys before proceeding by any route to Salen on Mull. Land at Salen in the bay past the old pier and by the few remaining stumps of the derelict pier(GR578 441). After the 5 minute kit check by Marshalls and allocations of tags, run to Salen and then along the B8053 to Knock and then left along the track on the SW of Loch Ba to tag check point at the forest road/track junction (GR568 372). 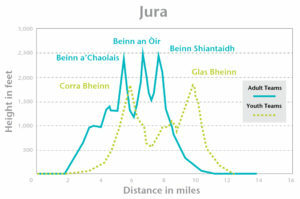 Classes 1,2,3, and All rounders, run up Glen Clachaig and Mhic Fhionnlaidh on to the spur of Ben More and traverse South of the subsidiary top A’Chioch to tag check point on Ben More summit (GR526 331). 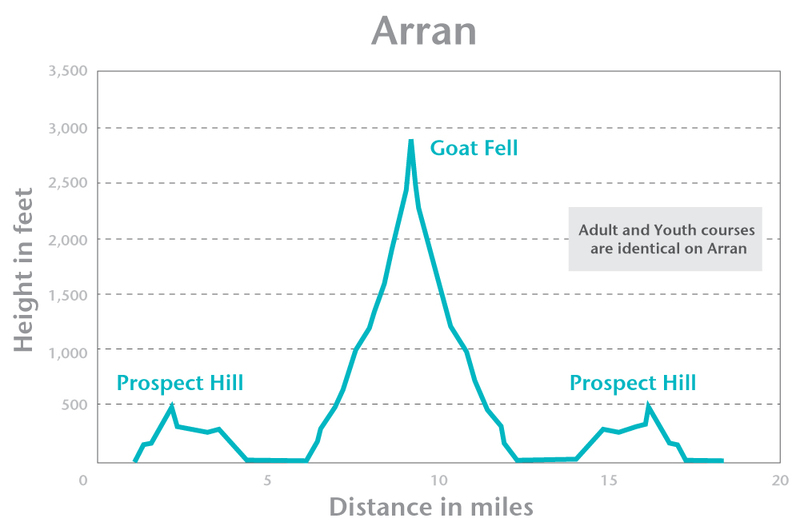 Descend NW through Coire nam Fuaran to tag check point at stream junction on upper Abhainn Disaig burn (GR519 338). Then proceed E over spur and traverse round Lag a’Bhasdair to tag check point on lower coll between Beinn Fhada ridge and A’Chioch spur (GR536 344). Descend E down into Glen Clachaig and return to tag check point at the forest road/track junction (GR568 372)(Loch Ba). Return to Knock and return along the B8035 to Salen Pier and hand in your final tag. Then sail by any route to Craighouse, Jura. 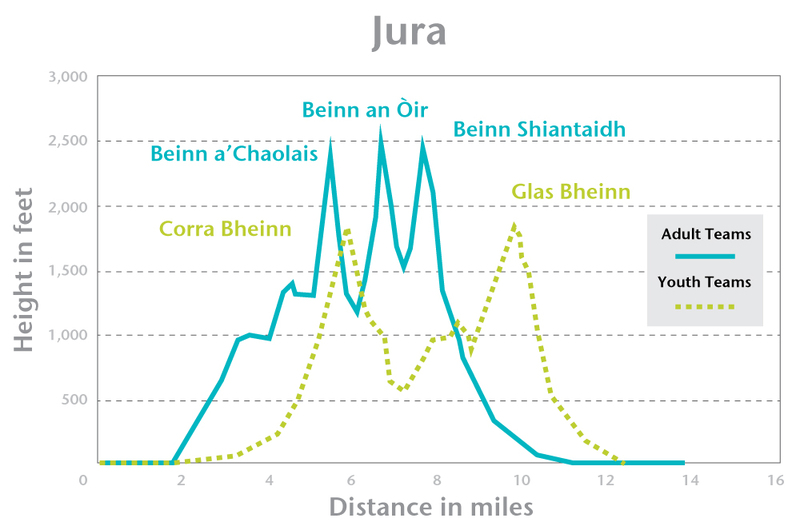 Turn left at Kiels (GR530 681) and go to first check point at Beinn a’Chaolais via Glen Astaile or alternatively follow the tarmac road to Jura Forest (GR535 700) and then via Glen Astaile to first check point at Beinn a’Chaolais . The check point is on the summit at (GR489 735). Leaving the top of Chaolais, detour E slightly to avoid the cliffs (not marked on 1: 50,000 OS) and down to the check point at Na Garbh Lochanan (GR495 741). Ascend Beinn an Oir where there is another check point and descend direct for Beinn Shiantaidh. Cross the coll at (GR505 748) and a grassy gully beckons you up Shiantaidh, coming out near the summit where there is another check point. Descend by any route to the check point at the three arch bridge (GR545 721) where there is a final check point, before returning to the hall along the road to hand in the last tag. After the 5 minute kit check by Marshalls and the allocation of tags, take the A841 E from the pier. Leave it where it turns N and follow the coastal lane. At (GR043 323) (check point) turn left on to the track up Prospect Hill and run N past Claughlands Farm. Follow the track until it joins the lane via South Corrigills. Rejoin the A841 at (GR023 354). Proceed to the check point where the track meets the ridge (GR997 415). 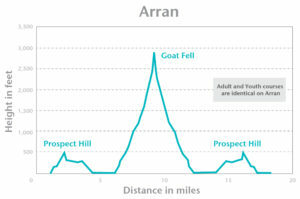 Proceed to the summit of Goatfell checkpoint (GR992 415)and return down the same route. Tags must be left at the ridge check point both out and home. The scree route must not be used (at the request of the National Trust). Return to Lamlash via your inbound route (South Corrigills and Claughands Farm) to hand in your final tag. Sail by any route to Troon.